A Helix piercing is performed on the cartilage on the outer ear rim midway between the top and middle of the ear. If the piercing is located more towards the top of the ear it is referred to as the Pina or towards the middle of the ear known as an Auricle piercing. It is also possible to get two of these piercings in close proximity which opens up the possibility of wearing a single piece of jewellery in both holes, this is often reffered to as a Double Helix. Helix piercings are performed in the cartilage which has no real nerve endings, so by nature are not that painful. The cartilage is quite thick so the piercer will normally have to use extra pressure when perforating which can cause a slight discomfort and bleeding. As with all ear piercings it is important to keep the area clean as infection can be introduced from hair and irritation. Slight bleeding is common as blood vessels may damaged during the process and is nothing to worry about. 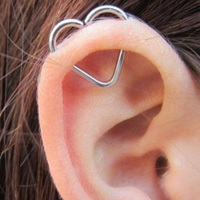 Healing times for a Helix piercing can be anything between 3 and 12 months depending on the individual. There is a vast assortment of jewellery that can be worn in this piercing from simple flat back studs, segment rings, ball closure rings to fancy jewelled cuffs. These piercings are usually 1mm (18g) but could also be made in 1.2mm (16 gauge) or 1.6mm (14 gauge). The most common sizes for Helix Jewellery are 6 or 8mm for flat back labret type studs and 10 or 12mm for BCR, segment and horseshoe rings. "fast delivery have brought from you before excellent service and good value"